The City of Atlanta has one of the largest urban tree canopies in the United States. This requires strong conservation efforts so both residents and visitors can enjoy and benefit from the canopy. Over the course of a ten-week summer internship at Georgia Tech, students created a few tools to assist non-profit Trees Atlanta and the Atlanta Tree Conservation Commission. Check out the interactive applications below or read more about the project and the motivations behind the work. Interact with trees planted by Trees Atlanta from 1994 to 2014. Use filters to explore by year and species. Search by address. 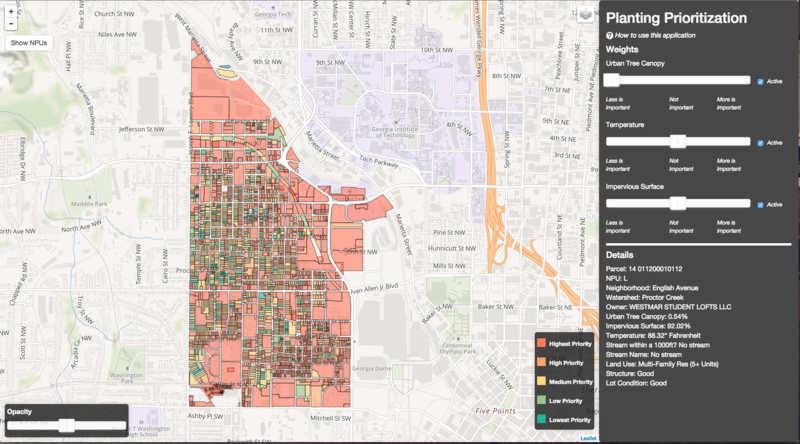 Use the same interaction tool to explore the Downtown Tree Inventory here.You can also explore the biodiversity of Trees Atlanta plantings broken down by NPU here. Interact with City of Atlanta parcels, or properties, by Neighborhood Planning Unit and see the amounts of urban tree canopy and impervious surfaces, temperature, and other details. Interact with contiguous tracts of forested land in the City of Atlanta. Learn about surrounding parks, water features, and amounts of urban tree canopy and impervious surfaces. Data Science for Social Good is an intensive, ten-week paid internship experience that places students onto multi-disciplinary teams working under the supervision of a professor on a problem that comes from a partner in the City of Atlanta or a local non-profit company. Mentors from the local data science practitioner community will provide additional guidance and support. See the full website and learn more about the program. Trees Atlanta is a non-profit citizens' group that protects and improves Atlanta’s urban forest by planting, conserving, and educating. One of their main tasks is to plant new trees around the city. The Tree Conservation Commission is a citizen board whose purpose is to assist in the protection, maintenance, and regeneration of the urban forest in Atlanta. Their responsibilities include handling tree permits, contracting Trees Atlanta to plant new trees, and purchasing forested land for preservation. The data used in this project is listed on the right, with links to the data that is available online. There are some inaccuracies with the new dataset built on these sources because of the variety and the time at which they were collected. However, it does provide a baseline for Trees Atlanta and the Atlanta Tree Commission to explore the information in new ways. Before developing the applications, the data had to be processed in ESRI ArcGIS. Data like streams, waterbodies, and the tree canopy were spatially joined to the city parcels. This resulted in a shapefile of parcel entries with necessary attributes to build the application on. PostGres and PostGIS function as the backend, since it can support ESRI shapefiles. This database was necessary due to the large amount of geospatial data and for sustainability purposes. PHP connects the backend to the frontend. The main libraries used in the frontend are d3.js and Leaflet.js.